Polaris is famous for producing innovative swimming pool cleaning and maintenance equipment. The firm provides a collection of pool vacuums, including pressure-side and robotic cleaners. Its pressure-side cleaners are suited for inground facilities that are exposed to huge pieces of debris or remains from surrounding areas. Which Polaris’ pressure cleaner would your swimming pool need? The Polaris 280 vs Polaris 360 vs Polaris 380? Here we will compare these three cleaners. The Polaris 280 is the older version of the Polaris 380. It needs a booster pump to function effectively. The Polaris 360 doesn’t require a booster pump. It utilizes your pool’s circulation pump. The Polaris 380 has an extra in that it cleans the bottom of your pool, the steps, and the walls. The other difference is that they cost different prices. The Polaris 280 is the original version and has been proven over time. It requires a booster, so although it cost the same as the Polaris 360, its total cost ends up being higher. The Polaris 360 doesn’t need a booster, which makes it cheaper to buy and operate (it doesn’t use extra energy to run). On the downside, it gives lots of stain to your pool’s circulation pump, which might wear out faster. The Polaris 380 has an edge in that it cleans the steps, the walls, and the bottom of your pool. It is very expensive as it costs more, and you will need to buy a booster too. Further, there are minor differences which might matter for some people. For example, the Polaris 280 has a wider vacuum inlet than the other two, making it perfect for pools near trees with giant leaves. The Polaris 280 comes with 2 jets nozzles while the Polaris 380 has 3 jets nozzles. Another difference, the Polaris 280 is operated by gears while the Polaris 380 is driven by a belt. Gears can make it harder to maintain your cleaner, at least for some pool owners. The manufacturer says Polaris 280 clears your facility of both large debris like pebbles and leaves and small particles like dirt and dust, in less than three hours. It is even able to clean the walls as well as hard-to-reach stairs and corners. The device comes with 2 jests that shoot debris and dirt up into the huge filter bag. 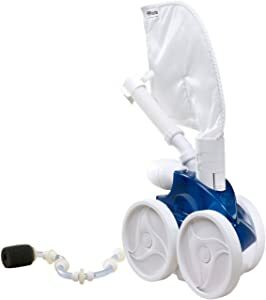 The Polaris 280 is suitable for all inground swimming pool floors including fiberglass and vinyl, and it connects easily and quickly to a devoted suction line. The cleaner features a rear sweep tail that can clean up additional dirt from corners and crevices. The product includes a 31 feet hose, which is perfect for most swimming pools. 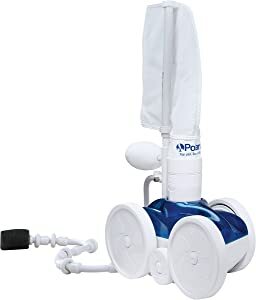 Another notable feature of this cleaner is the backup valve which automatically fires to ensure that the cleaner cleans your entire pool floor. The product has a reputation for cleaning well and lasting long. It is a mid-priced unit and provides an easy cleaning design. Comes with a unique filter that prevents pebbles from entering the unit. Great design that handles cleaning better. High maintenance of its valve is needed. This unit attaches to your swimming pool pressure line and cleans the entire pool in a few hours. One major benefit of this cleaner is that it doesn’t require a booster pump and it cleaning tech is powered by jets that offer it enough pressure to spray down the pool’s floor. It can clean all pool coatings including vinyl, fiberglass, and concrete, and it comes installed with a large leaf bag to eliminate stress on your pool’s filter while sucking up huge pieces of debris. 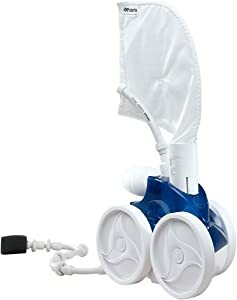 The cleaner also helps to circulate water as it maneuvers around your pool, and its jets drive it up the walls, across any surface, and over stairs. The Polaris 360 is available in 2 colors, white or black, offering you the choice to choose the color that best matches your pool’s décor. It comes with a 31-foot hose, which is sufficient to clean the majority of inground facilities. The other feature of this cleaner is the backup valve that automatically turns on/off at timed intervals to make sure that the device doesn’t stick in a corner or on the drain. Doesn’t require an electric port. It has an anti-tangle design. It collects finer dirt through the pool filter. The Polaris 360 is an effective pool cleaner that will leave your inground swimming pool clean. Driven by a belt system, three jets, and wheels, this device maneuvers via your facility and effectively clean it by scrubbing, sweeping, and vacuuming it. It features a large filter bag that collects huge debris from your swimming pool without needing emptying regularly. The tech used on its filter bag enables it to collect debris before they hit the pump basket hence prolonging the life of the machine. The 380 boasts of a greater ability to navigate via water and clean all the corners of your facility, thanks to the in-line backup valve which frees it in case it gets stuck and its climbing ability. This makes it ideal for cleaning swimming pools of any size, shape, and design. To use this cleaner, you will need a booster pump which is bought separately, and it comes with a 31 feet hose. It used to come in either blue or white color, sadly the black color was discontinued. Its replacements and accessories are readily available. Comes with a huge capacity filter bag. It requires a booster pump. Although produced by the same company, the Polaris 280 vs Polaris 360 vs Polaris 380 are different pressure cleaners, and each offers its unique features. So, the choice is yours: what will bring value for your money?